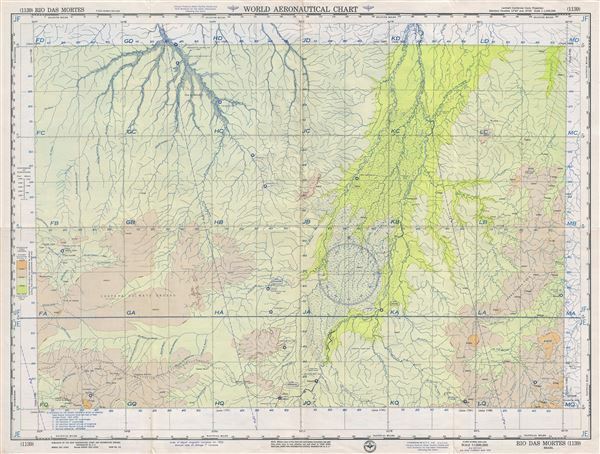 This is a fine 1955 U.S. Air Force aeronautical chart or map of the Rio das Mortes, the river that flows through the state of Mato Grosso in Brazil. It covers parts of the Brazilian states of Mato Grosso, Goias and Tocantins. The map is highly detailed and notes several rivers, towns, lakes, villages and other hydrographical and topographical features essential for the air pilot. Verso of this chart features legends and a World aeronautical chart index. This chart was published by the USAF Aeronautical Chart and Information Service and was issued as chart no. 1139. First issued in 1951, this is the third edition revised to Mar 1955.